If your organization uses Skype for Business today and you intend to start using Teams alongside Skype for Business—or you intend to start upgrading to Teams—it’s important to understand how the two applications coexist, when and how they interoperate, and how to manage users’ migration all the way to their eventual upgrade from Skype for Business to Teams. In addition to collaboration capabilities, Teams delivers chat, calling, and meeting capabilities. Depending on how you choose to deploy Teams, these capabilities will overlap with the capabilities delivered by Skype for Business for a given user. The default mode is to run Teams alongside Skype for Business; however, a user can be assigned one of several coexistence modes that were designed to ensure that these capabilities don’t overlap for that user. We recommend that you review the coexistence modes discussed below to help determine which path is right for your organization. Introducing new technology or making changes to your existing, familiar Skype for Business environment, while delivering great new business benefits, can be disruptive for users. Take time to assess user readiness and implement a communication and training plan before you implement any of the changes outlined in this article. In addition, we strongly encourage you to pilot your plan with a selected group of users before implementing it across your organization. 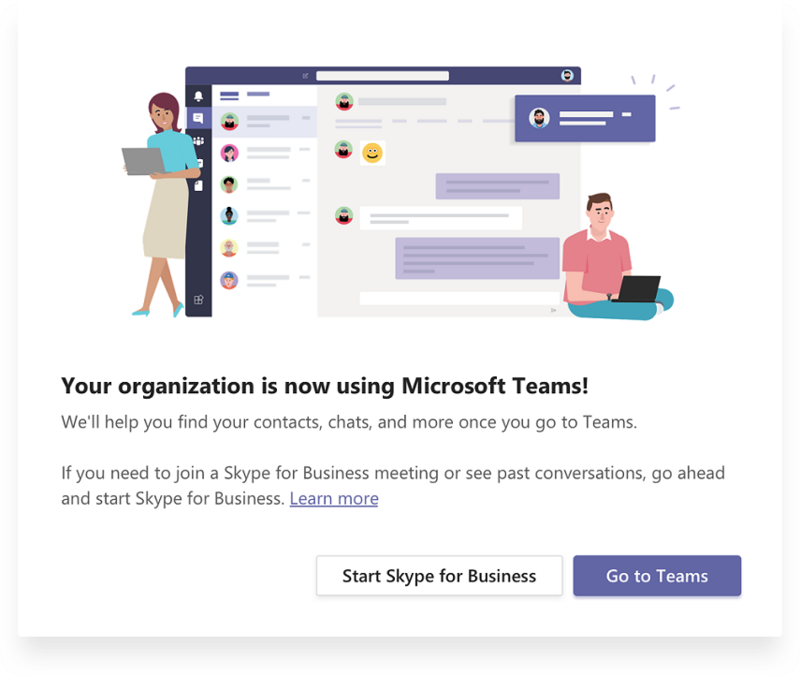 By default, users can run Teams alongside Skype for Business as two separate solutions that deliver similar and overlapping capabilities such as chat, calling, and meetings. Teams users also can take advantage of collaboration capabilities such as teams and channels, access to files in Office 365, and applications. In this coexistence mode, called Islands, each of the client applications operates as a separate island. Skype for Business talks to Skype for Business, and Teams talks to Teams. Users run both clients and can communicate natively in the client from which the communication was initiated. As such, there’s no need for interoperability in Islands mode. Skype for Business Online customers recommended path is to start with the default Islands mode, drive adoption saturation in the organization and then move to Teams Only mode rapidly. On premises and hybrid customers may benefit from deploying the upcoming Skype for Business with Teams collaboration mode as a starting point rather than Islands, and progress from there to Teams Only mode when the organization is ready to adopt Teams. In this coexistence mode, users remain in Skype for Business—not Teams—for chat, meeting and calling capabilities, and they don’t use Teams for teams and channels. This mode is available today; however, in the current implementation Teams modalities are not turned off for the user automatically. This capability is upcoming. In the interim, admins can remove the Teams license for any users who need to stay in Skype for Business as their only communications application. A Teams only user can only use the Skype for Business client to join existing Skype for Business meetings, or meetings on Skype for Business that have been organized by non-upgraded users or external parties. 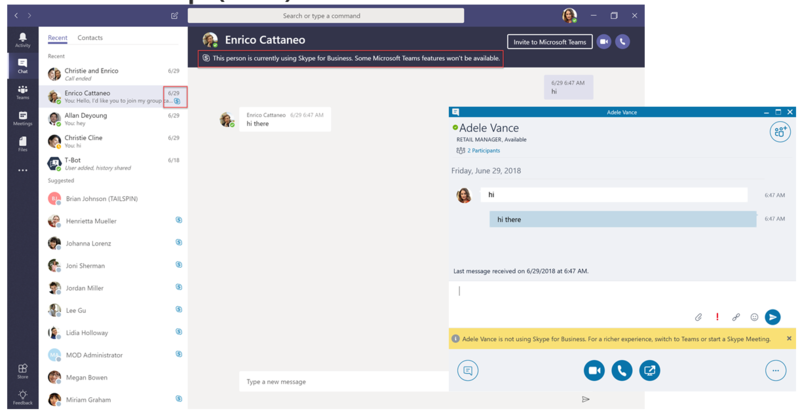 An upgraded user can continue to communicate with other users in the organization who are still using Skype for Business by using the interoperability capabilities between Teams and Skype for Business; however, an upgraded user can’t initiate a Skype for Business chat, call, or meeting. As soon as your organization is ready for some or all users to use Teams as their only communications and collaboration tool, you can upgrade those users to Teams Only mode. For additional considerations about moving to Teams Only mode, see Teams Only mode considerations. Use this mode to introduce Teams in your environment while you continue to leverage your existing investment in Skype for Business. In this mode, you leave Skype for Business unchanged with chat, calling, and meeting capabilities, and you add Teams collaboration capabilities—teams and channels, access to files in Office 365, and applications. Organizations with starting point of Skype for Business server on premises or hybrid should use this mode instead of Islands mode. Use this coexistence mode to accelerate the availability of Teams meeting capabilities in your organization, in addition to its collaboration capabilities, enabling your users to take advantage of the great quality, new capabilities such as transcription and translation, and support for meetings in browsers. Along with using Teams for teams and channels–based conversations in this mode, users start using Teams to schedule and conduct their meetings. Private chats, and voice and video calling, remain on Skype for Business. This coexistence mode is especially useful for users in Skype for Business on-premises deployments that have enterprise voice, who are likely to take some time to be upgraded to Teams, but want to benefit from the superior Teams meetings. When deployed in specific coexistence modes, Teams and Skype for Business can interoperate, enabling users to chat with and call one another, and ensuring that communications remain fluid across your organization during your upgrade journey to Teams. Coexistence modes govern interoperability. The coexistence mode of the receiver determines whether interoperability will be available. For example, if the receiver is in a mode in which chat is only available in one client (say, Teams), chat interoperability will generally be available in case the initiator uses the other client (in this case, Skype for Business) to start the chat. On the other hand, if the receiver is in a mode in which chat is available in both clients, interoperability won’t be available for the chat—and the message will be received by the receiver in the same client in which the initiator started the chat. For more details about coexistence modes, prerequisites, and management, see Migration and interoperability guidance for organizations using Teams together with Skype for Business and Setting your coexistence and upgrade settings. Which coexistence mode(s) best fit your organization’s and users’ needs? Choose the best approach for your upgrade journey. Interoperability is the ability for Teams and Skype for Business users in the same organization to communicate across Teams and Skype for Business. There are two types of interop experiences: native and interop escalation. A native interop experience occurs in the client that the user is currently using. One user will be in the Skype for Business client, the other in Teams. A native interop experience won’t take them to another client to communicate, the users will be able to conduct their conversation in the client they’re currently using. The native interop experiences are one-to-one chat and calling. An interop escalation experience means that as part of helping users perform an advanced action (such as sharing their desktop), the service can facilitate the creation of a meeting and continue the experience in that meeting. The meeting is created on the platform of the initiator of the action. The user or users who aren’t on that platform receive meeting join coordinates and join the meeting (after switching clients). Skype for Business users can chat one-on-one with Teams users, and vice versa. An interop chat needs to go through an interop gateway that’s part of Teams cloud services (and therefore only exists online). Interop chats are plain text: rich text and emoticons aren’t supported. Users in Teams are notified that the conversation is an interop conversation; a similar notification for Skype for Business users will be provided soon. 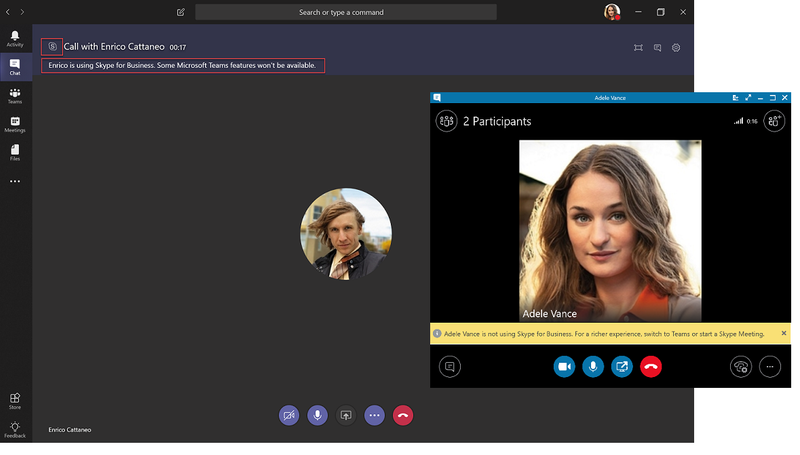 Skype for Business users can make one-on-one voice and video calls to Teams users, and vice versa. Interop experiences with an on-premises deployment of Skype for Business require that the on-premises environment is in hybrid mode with Office 365 Skype for Business. For details, see Migration and interoperability guidance. These interop experiences are available to and between users who have the one of the following coexistence modes assigned: Skype for Business with Teams Collaboration, Skype for Business with Teams Collaboration and meetings, Skype for Business Only, or Teams Only. There is no interoperability to users in Islands mode. Markdown, rich text, and the full emoticon set aren’t supported either from Teams or Skype for Business. Other native features of the compose box in Teams chats aren’t supported. Screen sharing (desktop or app sharing) between Teams and Skype for Business isn’t supported. Group chats (multiple-party conversations) in Teams can only include participants who are using Teams. Multiple-party IM conversations (group chats) in Skype for Business can only include participants who are using Skype for Business. Escalating an ongoing peer-to-peer voice or video call to a multiple-party call involving both Teams and Skype for Business users isn’t supported. File transfer for two-party chats, or file attachment in group chats, from Teams to Skype for Business—and vice versa—aren’t supported. There is no interoperability with Skype for Business Persistent Chat. For all these limitations (except for Persistent Chat), one possible workaround is for one user to start a meeting and invite the other user to join it. This workaround is the basis for interop escalation. What starts as a simple chat (IM) might quickly escalate to a call or an ad-hoc meeting. We understand that these scenarios are critical to the usability and user experience, and we’re continually evolving interop experiences between Skype for Business and Teams users. Check back for the most up-to-date information. After you review this article, see Choose your upgrade journey, Migration and interoperability guidance, Coexistence with Skype for Business, and Setting your coexistence and upgrade settings for implementation details.